Liquid Penetrant Testing | Dye Penetrant | RNDT Inc. Liquid Penetrant testing is probably the most widely used NDT method. The test object or material is first cleaned and then coated with a visible or fluorescent dye solution. After a pre-selected time interval (dwell time), the excess dye is removed from the surface, and then a developer is applied. The developer acts like a blotter and draws penetrant out of imperfections which are open to the surface. With visible dyes, the vivid color contrast between the penetrant and the developer makes the “bleedout” easy to see. With fluorescent dyes, an ultraviolet lamp is used to make the “bleedout” fluoresce brightly, thus allowing the imperfection to be seen readily. With a wide variety of penetrant materials and a custom made fluorescent penetrant inspection system, we can provide both field and lab, high volume processing of many different parts with both fluorescent and visible penetrants. Dye penetrant inspection (DPI), also called liquid penetrant inspection (LPI) or penetrant testing (PT), is a widely applied and low-cost inspection method used to locate surface-breaking defects in all non-porous materials (metals, plastics, or ceramics). The penetrant may be applied to all non-ferrous materials and ferrous materials, but for inspection of ferrous components magnetic-particle inspection is also preferred for its subsurface detection capability. LPI is used to detect casting, forging and welding surface defects such as cracks,suface porosities, and leaks in new products, and fatigue cracks on in-service components. DPI is based upon capillary action, where low surface tension fluid penetrates into clean and dry surface-breaking discontinuities. Penetrant may be applied to the test component by dipping, spraying, or brushing. After adequate penetration time has been allowed, the excess penetrant is removed, a developer is applied. The developer helps to draw penetrant out of the flaw where a visible indication becomes visible to the inspector. Inspection is performed under ultraviolet or white light, depending upon the type of dye used – fluorescent or nonfluorescent (visible). Penetrants are classified into sensitivity levels. Visible penetrants are typically red in color, and represent the lowest sensitivity. Fluorescent penetrants contain two or more dyes that fluoresce when excited by ultraviolet (UV-A) radiation (also known as black light). Since Fluorescent penetrant inspection is performed in a darkened environment, and the excited dyes emit brilliant yellow-green light that contrasts strongly against the dark background, this material is more sensitive to small defects. When selecting a sensitivity level one must consider many factors, including the environment under which the test will be performed, the surface finish of the specimen, and the size of defects sought. One must also assure that the test chemicals are compatible with the sample so that the examination will not cause permanent staining, or degradation. This technique can be quite portable, because in its simplest form the inspection requires only 3 aerosol spray cans, some lint free clothes, and adequate visible light. Stationary systems with dedicated application, wash, and development stations, are more costly and complicated, but result in better sensitivity and higher sample through-put. The test surface is cleaned to remove any dirt, paint, oil, grease or any loose scale that could either keep penetrant out of a defect, or cause irrelevant or false indications. Cleaning methods may include solvents, alkaline cleaning steps, vapor degreasing, or media blasting. The end goal of this step is a clean surface where any defects present are open to the surface, dry, and free of contamination. Note that if media blasting is used, it may “work over” small discontinuities in the part, and an etching bath is recommended as a post-bath treatment. The penetrant is then applied to the surface of the item being tested. The penetrant is allowed time to soak into any flaws (generally 5 to 30 minutes)is called dwell time. The dwell time mainly depends upon the penetrant being used, material being testing and the size of flaws sought. As expected, smaller flaws require a longer penetration time. Due to their incompatible nature one must be careful not to apply solvent-based penetrant to a surface which is to be inspected with a water-washable penetrant. The excess penetrant is then removed from the surface. The removal method is controlled by the type of penetrant used. Water-washable, solvent-removable, lipophilic post-emulsifiable, or hydrophilic post-emulsifiable are the common choices. Emulsifiers represent the highest sensitivity level, and chemically interact with the oily penetrant to make it removable with a water spray. When using solvent remover and lint-free cloth it is important to not spray the solvent on the test surface directly, because this can remove the penetrant from the flaws. 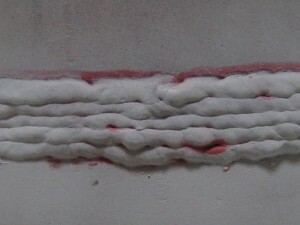 If excess penetrant is not properly removed, once the developer is applied, it may leave a background in the developed area that can mask indications or defects. In addition, this may also produce false indications severely hindering your ability to do a proper inspection. After excess penetrant has been removed a white developer is applied to the sample. Several developer types are available, including: non-aqueous wet developer, dry powder, water suspendable, and water soluble. Choice of developer is governed by penetrant compatibility (one can’t use water-soluble or suspendable developer with water-washable penetrant), and by inspection conditions. When using non-aqueous wet developer (NAWD) or dry powder, the sample must be dried prior to application, while soluble and suspendable developers are applied with the part still wet from the previous step. NAWD is commercially available in aerosol spray cans, and may employ acetone, isopropyl alcohol, or a propellant that is a combination of the two. Developer should form a semi-transparent, even coating on the surface. The inspector will use visible light with adequate intensity (100 foot-candles or 1100 lux is typical) for visible dye penetrant. Ultraviolet (UV-A) radiation of adequate intensity (1,000 micro-watts per centimeter squared is common), along with low ambient light levels (less than 2 foot-candles) for fluorescent penetrant examinations. Inspection of the test surface should take place after a 10 minute development time. This time delay allows the blotting action to occur. The inspector may observe the sample for indication formation when using visible dye. It is also good practice to observe indications as they form because the characteristics of the bleed out are a significant part of interpretation characterization of flaws. The test surface is often cleaned after inspection and recording of defects, especially if post-inspection coating processes are scheduled. RNDT Inc. provides nondestructive testing, industrial radiography, magnetic particle testing and more. RNDT, Inc. is an A2LA ISO-17025 accredited commercial testing laboratory headquartered in Johnstown, PA. Our field & laboratory services are offered to all industries. RNDT provides nondestructive testing in the form of industrial x-ray testing (industrial radiography), positive material identification (PMI), liquid penetrant, magnetic particle and ultrasonic testing and visual (CWI) inspections to most all industries. RDNT employs highly trained and experienced nondestructive testing professionals that hold current certifications conforming to the requirements of ASNT SNT-TC-1A & CP-189, National Aerospace Standard NAS-410 Rev. 3, Pressure Equipment Directive 97/23 EC for PED projects. These certifications satisfy global requirements for nondestructive testing personnel.